There is a bit of a ground swell of interest at the moment in the studio jewelry scene for chasing and repousse information (credit to Californian Marcia Lewis, Valentin Yotkov of NYC among many others). If this revival of interest follows previous patterns chasing will be showing up down the road in commercial trade work in the form of casting models for production, as well as one of a kind pieces. Chasing and repousse is carried out on various surfaces using steel punches to strike and manipulate sheet metal or cast objects. Flat pattern chasing or stamping sheet metal can be done on an anvil, or the bottom of an old iron which makes an excellent surface to strike on. Sometimes thin double-sided carpet tape works well to stick a piece of metal onto a flat surface for stamping or chasing like this. Most chasing and repousse however has more dimensional relief than flat chasing and is often done with the metal fixed onto pitch. Various pitch types and hardnesses are available from most tool suppliers. My favorite is a red chasing pitch from Germany. It is fairly soft, heats smoothly and is pliable at a low temperature (which avoids burnt fingers). Allcraft in New York carries it. The pitch needs to be spread onto a surface to use it. At its simplest this can be a flat board which sits on or is clamped to a table. For smaller objects pitch is spread onto smaller surfaces, for instance the 8″ length of broom handle that stonesetters use as a pitch stick. I’ve even seen a blob of pitch on the end of a pencil as a miniature version to hold a tiny metal piece. Sometimes a flat platform attached to a file handle serves as a larger surfaced pitch stick. 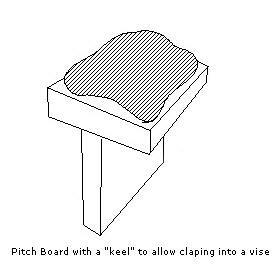 T-shaped boards for pitch are common, that is a round or square flat piece of wood with a ‘keel’ screwed to it to allow it to be clamped into a vise or an engraver’s ball. Sometimes sheet metal to be engraved is secured with pitch like this. The GRS Bench-Mate® holding system comes with a T shaped piece of aluminum channel for putting pitch on to use with the Bench Mate. Here is a picture of a selection of pitch bearing surfaces. On the left is a small pitch board mounted on a file handle, then the T-section for the bench mate, behind is a lump of Aquaplast thermoplastic (to use instead of pitch), a setters pitch stick and a larger pitch board with a T-section for mounting in a vise. Behind them is a bowling ball, cut, but without any pitch on it yet. 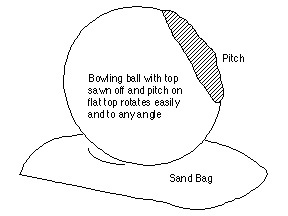 The best pitch holding device for chasing however is a pitch bowl. 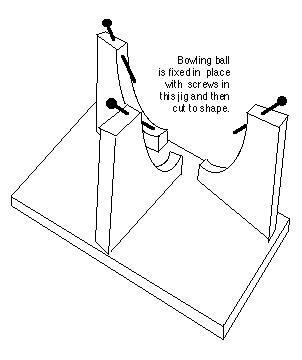 Unfortunately most commercially supplied pitch bowls are not properly designed, or are simply not heavy enough. 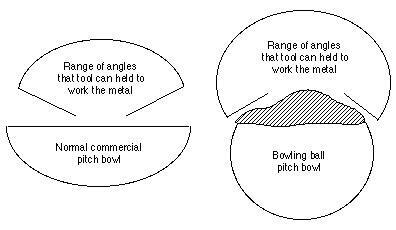 A pitch bowl should rotate smoothly to allow easy access from all sides. It should be very heavy (full, but almost totally full of lead is a good start) so that when you chase on the work the bowl does not shift under the blows. As well, there are times when you want to work the metal from the side, almost parallel to the top plane of the bowl, and for this the bowl should be able to be tipped sideways. This means that a hemisphere or flat bowl is no good, and instead you need something even more spherical. 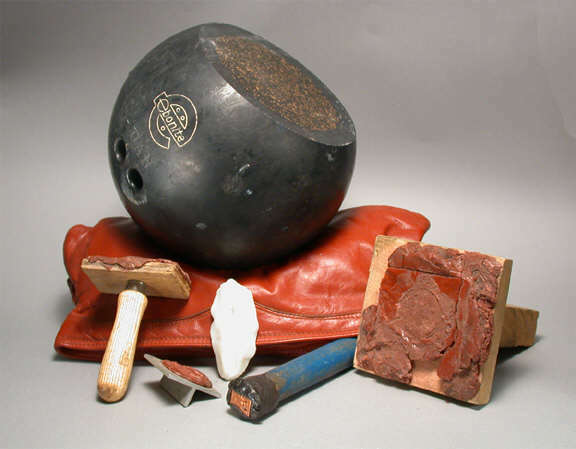 An answer: a bowling ball! We’ve found that a used ball is often less than $5.00 at a thrift store, and we’ve even had a bowling alley give us scuffed balls free for our students. One cuts off about 1/4 of the ball, perhaps a little more, but no more than a third. This gives you the perfect shape, and the pitch is simply spread and mounded on top of the flat spot produced when you cut the ball. This offers a greater angle of attack with your tools than a standard pitch bowl. And you can have a pitch bowl with sparkles or other decorative patterns if you like. The pitch bowl needs to be on a sandbag for best results, and my favorite sandbag is again from a thrift store, an old leather handbag with a zipper (normally less than $2.00). You take a couple of plastic grocery bags, put sand in one, knot it tight, cover it with the next plastic bag and knot again. Then you zip it inside the leather handbag. Now you have a great leather sand bag with a handle, a sand handbag. Feel free to stuff it full as the leather will stretch in use as the ball settles into it. Here is a picture of a jig we have found useful for immobilizing the bolwling ball while band sawing the 1/4 or more off it. You should have an experienced woodworker make the jig and do this cut. The ball is screwed into place in the jig so it cannot move or shift while being cut wiht a band saw.